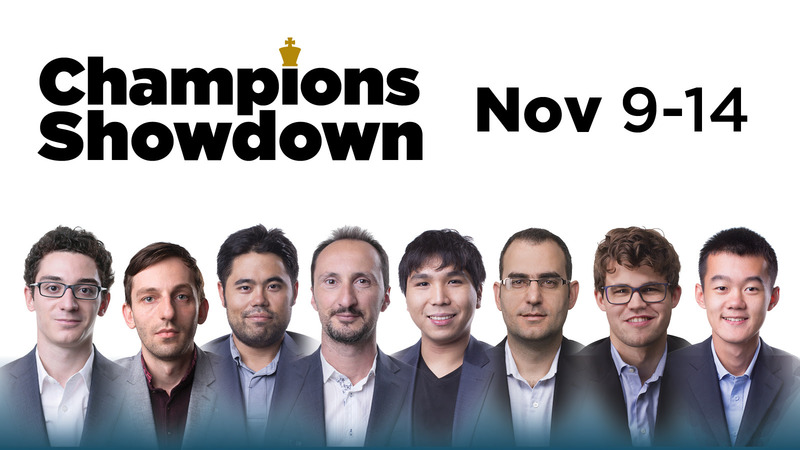 The Champions Showdown started today, November 9, 2017, at the Saint Louis Chess Club. An amazing four-match event was put together and the top players answered the call; they came ready to show their determination and grit to outplay their opponents. The most interesting aspect of the event is surely its time control. With no increment or delay, the players are forced to adapt and prosper in unconventional situations. 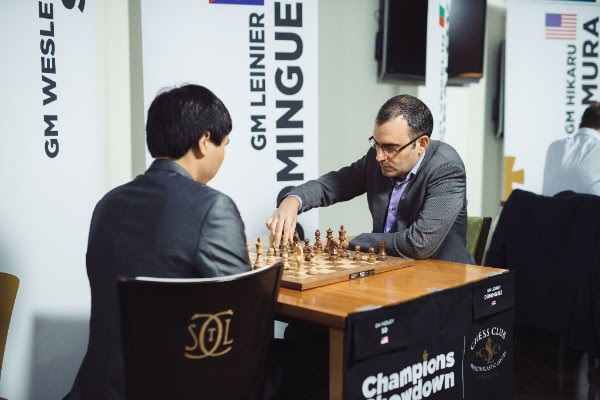 The first day was filled with thrilling chess as well as a fair share of drama, as some of the games ended after severe time pressure situations. Let’s get into the recap, match by match! In my opinion this was the match of the day. Both players came to the rounds extremely motivated, ready to explore new ideas in an attempt to throw off their opposition. Fabiano started off blazing hot, securing an early victory after accurately outplaying Grischuk in a Sicilian Najdorf. Game two was a complete mess, with the advantage switching sides until the last phase of the game, during which the players threw out any concern for safety and went all out in an attempt to simply play faster than their opponent. 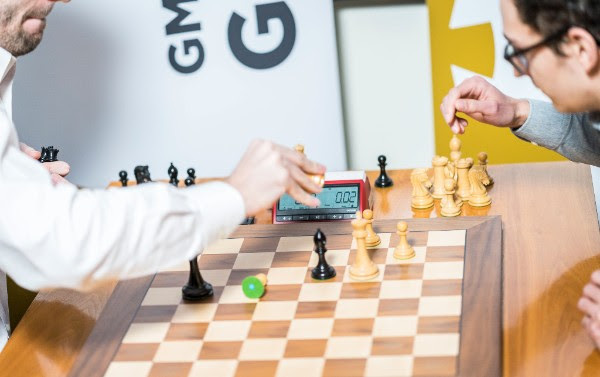 Grischuk managed to capture all of Fabiano’s pieces before he ran out of time and the game was called a draw due to lack of material. 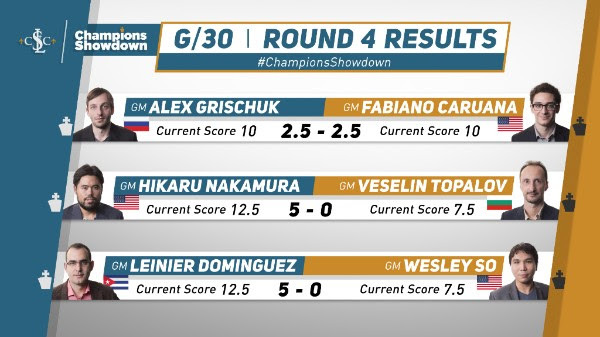 Game three saw Grischuk simply outclass Caruana, who carelessly attempted an unconventional pawn storm on the kingside, an attempt that seriously backfired. Game four was a tense battle but neither of the players were willing to take unnecessary risks and the game ended in a draw. Nakamura was considered by many to be the big favorite of this match. The first round of the match was a fairly tame affair and the players reached a draw without much fuss. The last three games were all very explosive and combative encounters as the players revved their engines and exchanged blows for the remaining of the day. 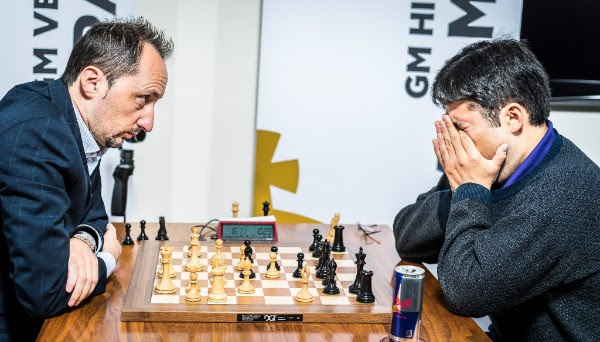 Game two and four went Nakamura’s way, while the third game was a beautiful attacking masterpiece by Topalov. This was arguably the least exciting match due to the extremely solid style of both of these players. The match saw four consecutive Berlin openings and the match seemed to be heading toward a 2-2 result until the very last moments of the day. In game four, Dominguez pressured his opponent and was heading toward a comfortable win. But then, the situation became complicated due to the time control. In a severe time scramble, So made the final error and allowed Dominguez to take the lead heading into day two of the event. Tomorrow the time controls get shorter as the players will have only 20 minutes each to finish their games.